We are instrumental in providing our clients a comprehensive range of Designer Wear Fabric that is highly demanded in the market for its intricate finish and elegant design. Woven by our highly experienced designers as per the latest fashion trends, the offered fabric is spun by using the best quality yarns and threads. 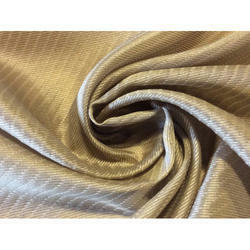 Offered fabric is highly valued by our clients for its smooth texture and ravishing finish. Apart from this, clients can avail this fabric from us at rock bottom prices. Owing to our vast experience in the concerned industry, we are offering a comprehensive range of Designer Wear Fabric. Our experts make use of genuine quality yarns and state-of-the-art technologies while weaving this fabric. This fabric is very comfortable to wear and widely demanded by our clients for its numerous features. Moreover, this fabric is tested on variegated parameters to ensure flawless dispatch at the clients' end.